It was all smiles at the White House. The romance is back on, said David Nakamura in The Washington Post. A beaming President Trump announced last week that the June 12 summit in Singapore with Kim Jong Un is a go, just nine days after he abruptly called the meeting off. All it took to earn his forgiveness was a letter from Kim, hand-delivered in a “cartoonishly oversize envelope” by envoy Kim Yong Chol, the former head of North Korea’s spy agency. Trump and the envoy schmoozed in the Oval Office for 90 minutes, the first time a North Korean official has set foot in the White House since 2000. Presidents usually work to maintain their “game faces” when meeting foreign adversaries, but Trump was grinning from ear to ear. 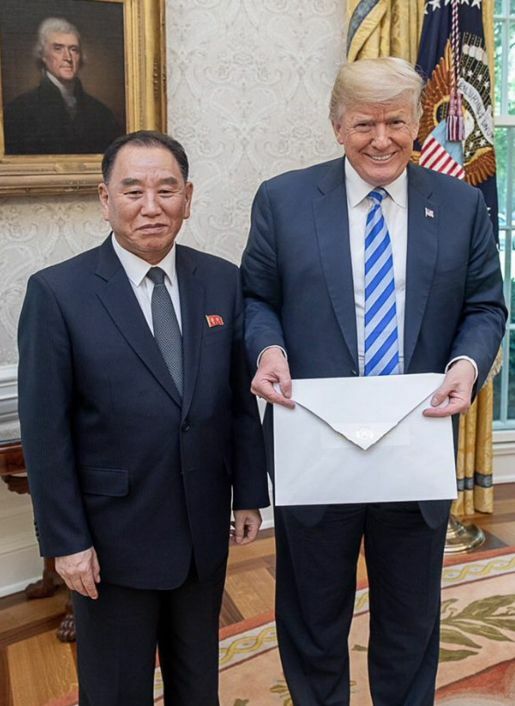 He was too gleeful, in fact, to bother reading the letter before committing to meet with Kim. “I may be in for a big surprise, folks,” he said. “Go figure,” said Nic Robertson in CNN.com. Barely a week ago, Trump was protesting North Korea’s “tremendous anger and hostility” and demanding that Kim agree to complete and rapid denuclearization as a pre-condition to any summit meeting. Now the president says the summit is merely a “getting to know you” opportunity—the first step in a long process. So much for Trump’s tough negotiating style. No matter what happens in Singapore, said Robin Wright in The New Yorker, Kim has already scored a great victory. By building nuclear weapons and ICBMs that can reach the U.S., Kim has gotten “a meeting with the world’s most powerful leader.” And by agreeing to negotiate with Trump, he’s “been transformed from the head of a hermit kingdom ostracized and sanctioned by much of the world” to a leader with enormous leverage, sought out by China’s president and the Putin regime.